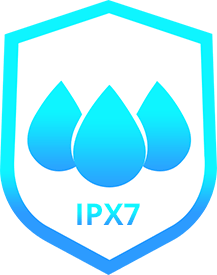 When a product features an IPX7 waterproof rating, it means it can be fully immersed water for 30 minutes reaching a depth of 1 meter. If a speaker is IPX7, you can take your music to the beach or the pool and really bring your adventure to the next level. Best companion for the pool & the beach. Element Force+ is the ultimate, high-powered waterproof Bluetooth speaker with powerful stereo sound. Compact in size, powerful sound. The Element Force Bluetooth speaker delivers powerful sound with extra bass to bring your party anywhere. Motivate yourself with superior HiFi sound. With the highest possible IPX7 waterproof rating, dirt, dust, water and sweat will never get in the way of you enjoying your music. Superior bass sound, all day long. Designed to withstand heavy rains and strong waves, Groove provides 24 hours of your favorite music. 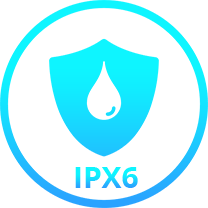 When a product is rated IPX6 water-resistant, it means it is protected against heavy splashes, rain and sweat; but it should not be fully immersed in water. The Blaze can withstand rain, water splashes and sweat. Moreover, with 3 cool lighting modes, it gives your party an extra gleam of light. 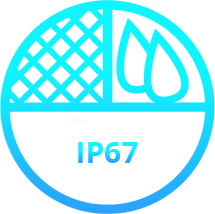 When a product features IP67 waterproof, it is protected from dust and capable of being fully immersed in up to one meter of water for 30 minutes. Ready for the pool andthe beach. With an IP67 rating, the Element Splash can be immersed in water providing superior deep bass sound without any damage. 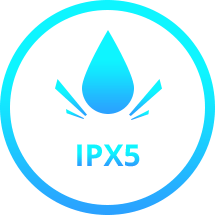 IPX5 offers protection from water being splashed at any direction, meaning it can fully withstand rain and sweat. True wireless listening coupled with exceptional sound and comfort. Rated IPX5, the headphones can be protected from rain, splashes and sweat allowing you to stay connected no matter how harsh the environment. Wireless connection for 24 hours. Boasting an IPX5 rating, the S2 Plus is built to keep you connected for up to 24 hours. A rainy day on the trail or a sweat breaking workout is no match for the Encore S2 Plus.